When decorating the bedroom, picking the right headboard is sometimes one of the hardest things to do. The headboard is a focal point of the room so it is essential to get it right. Follow these top tips to help you make the right decision for style, comfort and functionality. Consider the height of the people using the bed; remember that children will not need as high of a headboard as an adult and someone sharing a bed will not need as wide of a headboard as someone who sleeps alone. Also factor in the size of the bed and room. If you only have a small bedroom a low headboard will create more space. You could also use a headboard with built in storage to give you more room. If you have space to make the headboard a feature, a board which is wider and higher than the bed is a great way to create a sophisticated and stylish look. If the frame is part of the style, make sure that you pick a neutral design that will go with your personal taste. 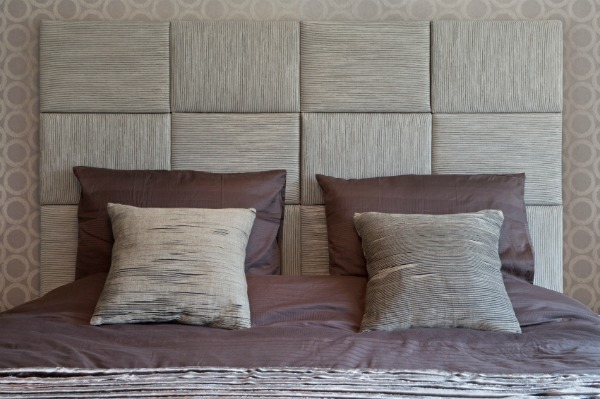 Upholstered headboards are great for creating a striking and stylish look. Bold, patterned fabrics add a splash of colour and create a focal point for the room. It can be the most practical option, too if you sit up in bed to read or watch TV, as it will be more comfortable than a metal or wooden frame. Leather headboards are great for a sleek and modern look in a contemporary, minimal bedroom. Leather may not be the most comfortable material to lean against, so consider more pillows. Wooden headboards are great for country style and traditional bedrooms. Consider painting and weathering the wood to get the rustic French look. Metal headboards are perfect for an urban feel. Black metal frames are great for a dramatic look, especially against minimal décor. If you are buying a bed from scratch, consider choosing a divan bed without a headboard already attached. This will mean you can decide yourself which headboards you use, giving you endless choices for style and décor. If you do decide to go for the detached bed, make sure that you get the correct fittings when buying the headboard.